Wed., June 27, 2018, 4:49 p.m. 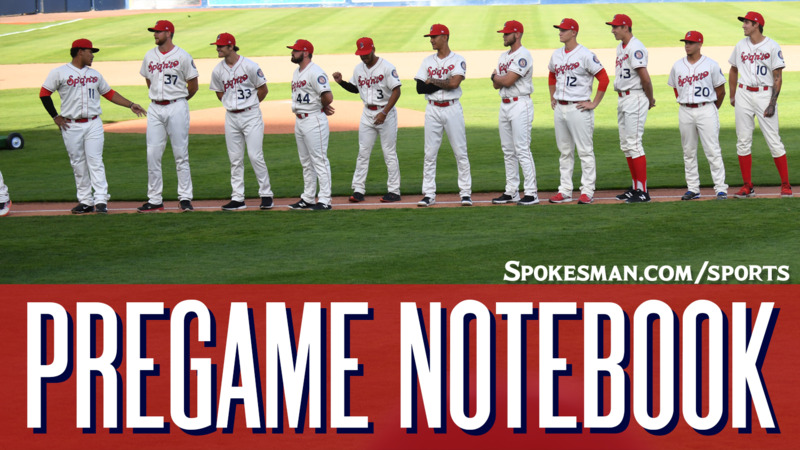 The Spokane Indians (5-7) take on the Everett AquaSox (7-5) in the second of a three-game Northwest League series at Avista Stadium at 6:30 p.m.
Indians starter Hans Crouse makes his second start of the season. In his first, on June 21 against Tri-City, he went two innings and allowed a run on one hit and three walks. Crouse, the Texas Rangers No. 4 prospect and 2017 second-round draft pick, was slated to start opening night but was scratched due to a cut on a finger on his pitching hand sustained during warmups. The AquaSox send out lefty Orlando Razo (0-0, 3.12). Razo, 23, was a 16th round pick of the Seattle Mariners in the 2017 draft. He has made two starts and has allowed three earned runs on seven hits and four walks with eight strikeouts over 8.2 innings. Last night: The Indians won their third in a row, as Curtis Terry capped a four-run eighth inning rally with a two-run blast and the Indians beat the AquaSox 7-5. Player focus: 1B/DH Curtis Terry, the 2017 NWL home run leader, has picked back up where he left off. Terry leads the league in homers with five, RBIs (13) and slugging percentage (.730). He has hit homers in the past two games and five of his last six home games. Promotion: Jersey off the Back and Grand Slam Sweepstakes. If a Spokane Indians player hits a grand slam home run during the game, one lucky fan will walk away with a new Ford F-150 Super Duty Truck. Also, each inning, as the Spokane Indians leave the field, one lucky fan will receive a player’s autographed jersey. Weather: Game time – Sunny and calm, 79. Final out – Clear, 67. Published: June 27, 2018, 4:49 p.m.